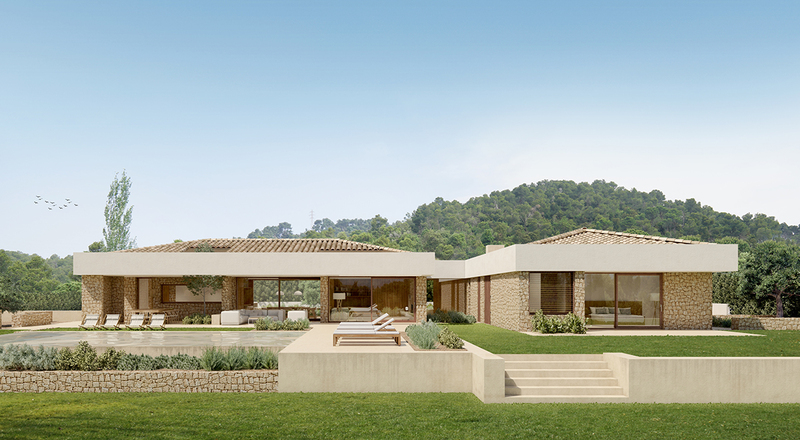 The south-facing plot is located in Montrás, with a slight slope towards the bottom of the site. 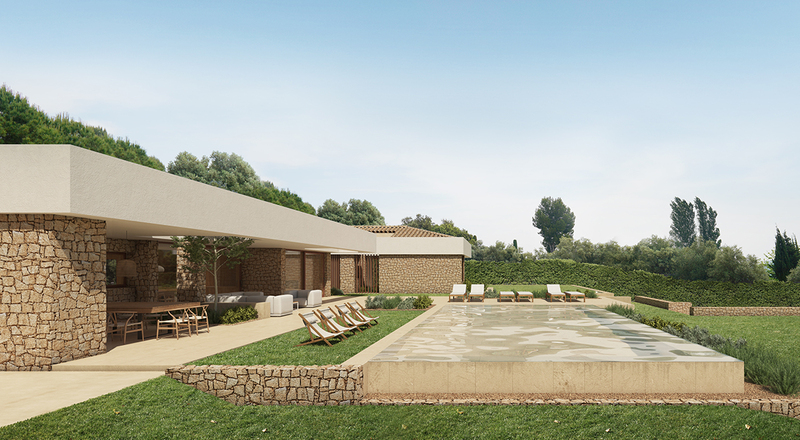 The house is placed in the upper part of the land leaving most of the space at the front, where the pool and outdoor spaces are located. 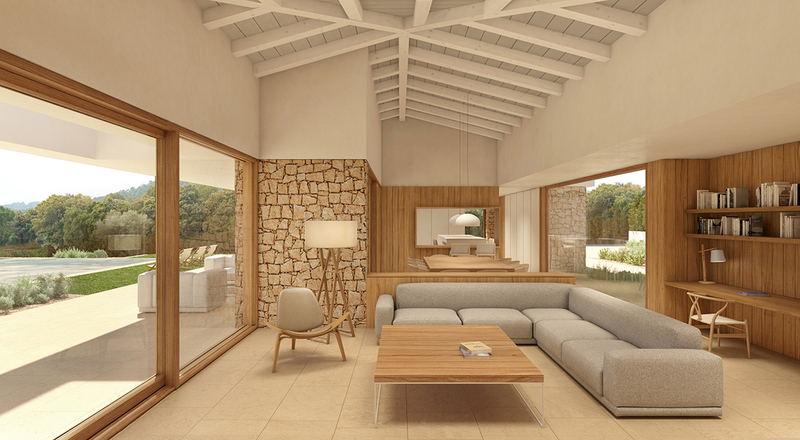 The main idea was to connect the interior spaces of the house with the outside, open the rooms to the garden and visually communicate the interior with the surrounding nature. All the main rooms are located on the ground floor, and there is also a basement floor where the auxiliary areas such as parking, warehouses and facilities, and the games room are located. On the ground floor we propose two differentiated volumes, placed perpendicularly. This strategy and disposition allowed us to dominate the garden and take advantage of it in all its orientations. One of the volumes is where the dining room and the kitchen are located. This faces south and has the porch at its forefront. The other volume, is where the bedrooms with their bathrooms are placed, facing south and east. The core of access and circulation articulates these two pieces uniting both volumes and opening up towards a contemplative patio. The floor of the house based on 2 rectangles, becomes a permeable geometry, created by patios and setbacks that appear around its entire perimeter. This rich perimeter generates small contemplative gardens, porches and outdoor covered areas, which open the house to the outside and produce a spatial continuity with the garden and the closest environment. The regulations of the area, required the roof to be pitched. Yet we wanted to give a more actual feel to the house, with a permeable cover in which gaps and patios could appear to help us to integrate the house with its exterior. We generated a belt at 2.5m height, which unified the entire roof and the diverse cavities, so that the pitched roof, finished with reclaimed artisanal tile, was in the background. The slopes of the hipped roofs are always starting from the outside of the rectangle, as the lowest point. A series of patios, like emptied out volumes, burst in throughout its perimeter. 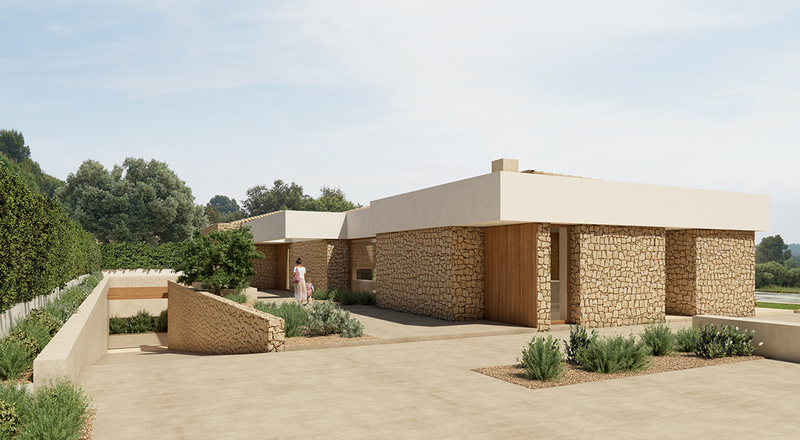 The facade of the whole house combines large segments of dry local stone walls, with the upper belt in a “sate” finish, made out of mortar. 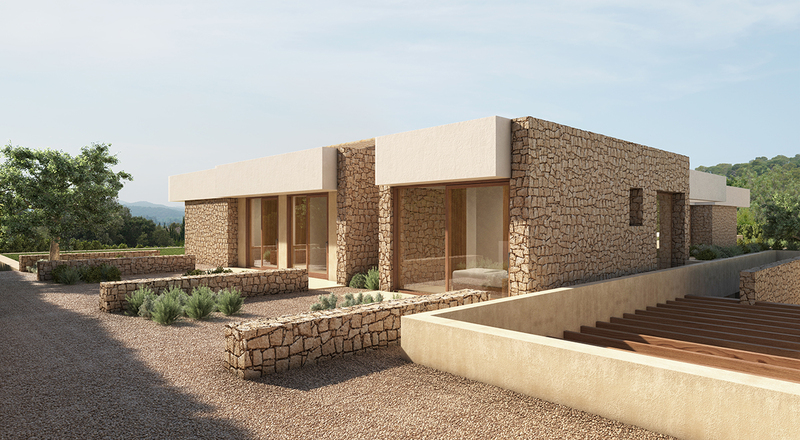 We always use natural colours, sand and stone, which integrate the house to the place where it sits. In the interior we take advantage of the sloping roof, to gain height inside the main rooms, leaving the wooden ceilings open to view. 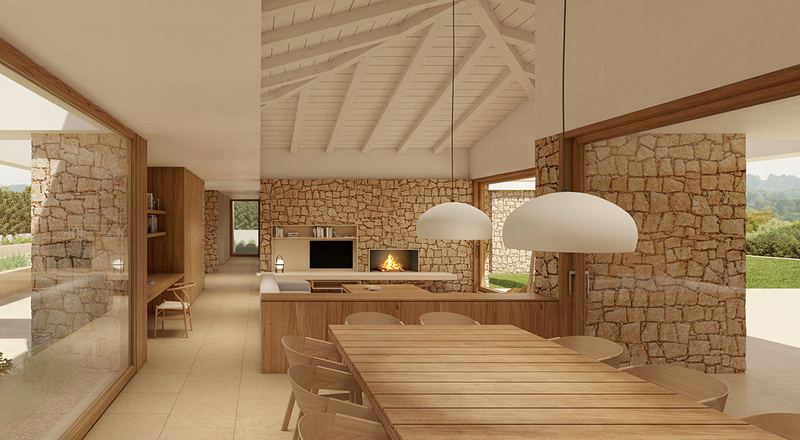 With the rest of the materials we tried to give the house a more traditional and Mediterranean look, with lime stucco on walls, dry stone walls that enter the interior and aged woods, which gave the spaces a cozy atmosphere. Contrasting with the distribution of spaces, which is very open and actual, always generating points of view towards the garden and the courtyards in all the internal circulation paths. The exterior pavements of coarser garden areas and ramps for car access are made with dyed concrete. Both the interior pavement of the house and of the exterior living areas are of the same porcelain stoneware.